The first step is to plug your new Teensy in using the USB cable. 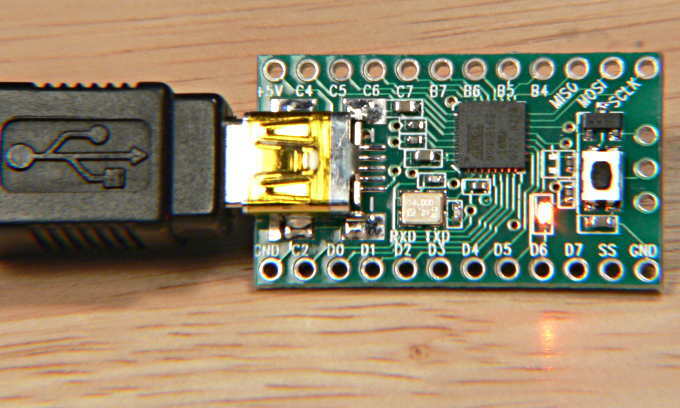 Simply plug the Teensy board in to a USB port to get started. All brand new Teensy boards come with the LED blink program pre-loaded. You should see the Orange LED blink slowly, 1 second on, 1 second off. If your Teensy is not brand new, it will run whatever program the previous owner loaded, perhaps causing your computer to recognize new hardware and require drivers. Just cancel any driver setup. In the next step you will load the LED blink program. If your Teensy should blink but does not, please check the USB cable to make sure it is properly connected. Your computer must be on so it provides power to the USB port. If you still experience problems, try a different USB port or different computer. Your Teensy contains 2 programs, the LED blink (user program) and the HalfKay bootloader. HalfKay, together with the Teensy Loader software, allows you to easily load new programs. Normally, the user program will run. To run HalfKay, press and release the tiny pushbutton. Press and release the pushbutton to enter HalfKay bootloader mode. The LED blinking will stop, because HalfKay never lights the LED. Your computer may briefly display a message or beep to indicate new hardware. Windows, MacOS-X and Linux have built-in drivers that are automatically used, so you never need to install drivers for HalfKay! The next step is to install and use the Teensy Loader application to download different programs to your Teensy board.